The BP oil spill is about to take a turn for the worse. The ocean floor on top of the Deepwater Horizon well is showing cracks and may be on the verge of collapsing completely, increasing the oil spill in the Gulf of Mexico exponentially. 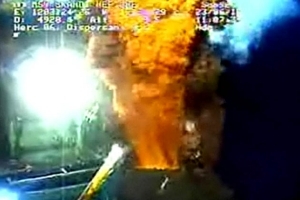 Several geologists and drilling engineers have studied live video and pictures of the ocean floor structure next to the rising pipe and right above the BP well. They have concluded with certainty that there are several cracks visible already that may further impact the entire integrity of the ocean floor. The partial capping of the riser pipe may have been the cause that increased the pressure inside the well and caused several cracks on the ocean floor right above it. If the floor were to lose its integrity and collapse, then 150,000 barrels of crude will find its way to the surface of the Gulf of Mexico on a daily basis. The cracks or collapse of the floor cannot be contained nor remedied with any available technical equipment and may affect other nearby wells that still operate in the vicinity. Scientists and experts expect that a collapse of the ocean floor will become the largest environmental disaster in history with an uncontrollable amount of crude coming to the surface and further threatening all Gulf States that are already battered and hurt. The BP solution to use relief drills will not be available until mid August and will be too late to prevent a collapse, deemed to be imminent. More than 150k barrels of crude together with 450 million cubic feet of methane gas will be unleashed in the Gulf of Mexico on a daily basis. All the crude oil will follow the slip stream of the Gulf Stream and travel along the Eastern seaboard as it makes its way up north and ultimately into the Atlantic. According to documents obtained from the Coast Guard, the White House was informed of such a threat within days after the collapse of the BP drilling platform on April 22nd but failed to inform the American public. The cracks on the ocean floor are the direct result of the single string casing used by BP and the failure to apply proper cementing bond logs in addition to only using 6 centralizers instead of the recommended 21. If ocean floor collapses and subsequent tsunami happens:widespread destruction of US coasts, cities, more. The Nuclear Option may be considered. But using a nuclear bomb to seal the oil leak should NOT be an option. Here’s why.